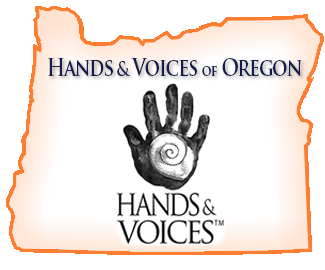 Hands & Voices of Oregon is part of an international, parent-driven, non-profit organization. The Oregon chapter was established in the spring of 2009. Since then, H&V Oregon has supported many families in IFSP’s/IEP’s, advocacy, support and education. As parents of children with hearing loss, and professionals working with children that are deaf or hard-of-hearing, the Board of Directors and volunteers are committed to providing the best support possible. In the early 1990s, the Smithsonian Institute in Washington, D.C., was preparing an exhibit called “Silent America.” It was intended to raise positive awareness of the Deaf Community, highlighting cultural and linguistic (ASL) aspects of the Deaf experience. Meanwhile, a number of people who were deaf or hard-of-hearing, but who were not living with those aspects of the Deaf experience, had a problem with the exhibit. From their perspective, it did not represent who they were specifically – listening/oral communicators. They resented what they perceived to be the exclusionary nature of Silent America’s point of view. Controversy erupted. Angry letters were sent between the signing, oral-deaf communities, and the Smithsonian exhibit planners. In the end, the Smithsonian scrapped the whole project. Regardless of what side anyone was on, we all lost that battle. As individuals who are in so many ways connected to each other through deafness or hearing loss, we’d had an opportunity to rally around the things that unite us, and show the whole world how we could come together as a community. Instead, we burned ourselves out in the same old, heated arguments over communication methodology. Hands & Voices is committed to supporting families and children, regardless of their chosen communication methodology. Whether signing or oral communication, Hands & Voices is there to support families through their journey in raising a child with hearing loss without bias. We don’t want to repeat the heated and unproductive events of the past. Our mission is to focus on what is important – what your family wants! We help to support you through the process because we understand what it is like to have a deaf child(ren). When a child is diagnosed as deaf or hard-of-hearing, not only does the family have to deal with finding out their child has a disability, they have to choose how their child will learn and communicate. Families face the following questions regarding modes of communication: Should we choose sign language, and if so, which form? Will our child benefit from hearing aids, or does their level of hearing loss warrant a cochlear implant? Should we use the auditory/verbal approach, or can we use a combination of all of these approaches? Does my community have the resources to support our decisions? What are our rights to a free and appropriate education for our child? These questions are just a few, among many, that many families will have to explore.